Members of the BHS Cybearbots compete in the FIRST Robotics competition. 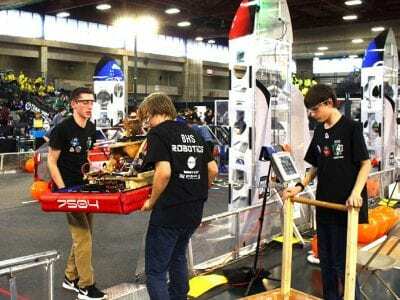 Photos By Lauren KnorrThe Brewster High School robotics team known as the Cybearbots has quite a future. After seven months of preparation and six weeks of working to get their … Please login below or purchase a subscription to the Putnam County Courier to access this content. Ninth grade students in Jessica Juska’s English classes at Brewster High School were inspired by Linda Park’s novel, “A Long Walk to Water,” which details the laborious task young people encounter reach day in Africa searching for and collecting drin… Please login below or purchase a subscription to the Putnam County Courier to access this content. 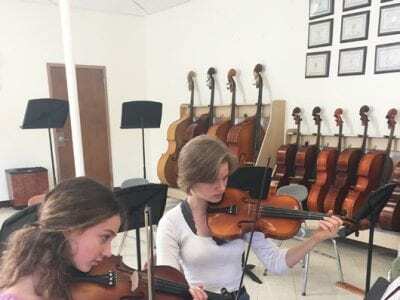 CHS students Greta Vaughn and Siobhan Cosgrave practice during a recent music class. Photo By Joe PhillipsFor the sixth year in succession, the Carmel School District has been recognized by the NAMM Foundation (National Association of Music Merchants… Please login below or purchase a subscription to the Putnam County Courier to access this content. 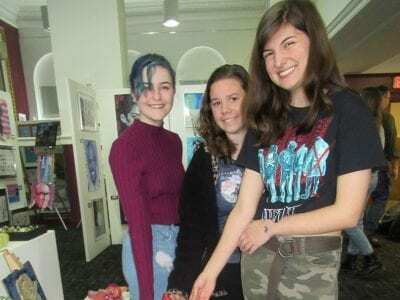 Photos by Eric Gross Carmel High School sophomores Mia Crawford, Amber Oster and Molly Radigan enjoyed browsing through the wide variety of artwork. At left, a caricature of actor Danny DeVito was a favorite. The portrait was painted by Margaret Knap… Please login below or purchase a subscription to the Putnam County Courier to access this content. Western New England University congratulates more than 700 students named to the Fall 2018 Dean’s List. 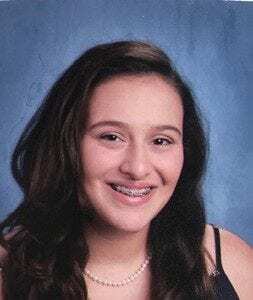 Students are named to the Dean’s List for achieving a semester grade point average of 3.30 or higher, and included Sara Cunha of Mahopac, majoring… Please login below or purchase a subscription to the Putnam County Courier to access this content. 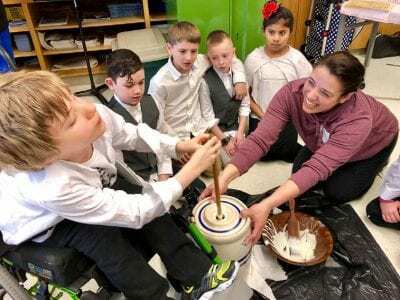 Children participated in a variety of activities during the Colonial Fair including churning butter, using a spinning wheel and writing with quill pens. Photos By Jennifer GaryCreativity, hard work, teachers’ collaboration and funding from the Brewst… Please login below or purchase a subscription to the Putnam County Courier to access this content. Get those bell-bottom trousers out of storage. Clean up the white bucks or saddle shoes! Putnam County will be welcoming back several musical stars of yesteryear thanks to the Lake Mahopac Rotary Club which on May 10 will present its 7th annual Doo … Please login below or purchase a subscription to the Putnam County Courier to access this content. Photo Courtesy Phyllis Hoenig Nina Plateroti will be attending the Students in Albany program this spring.Mahopac High School junior Nina Plateroti will be representing the Putnam County chapter of the League of Women Voters at the 19th annual Studen… Please login below or purchase a subscription to the Putnam County Courier to access this content. Molly Ross of Patterson has been named to the Dean’s List at John Carroll University for the Fall 2018 semester. Saint Anselm College senior Abigail Nolan, of Mahopac, co-led a volunteer trip to Winston-Salem, N.C., during her winter break through t… Please login below or purchase a subscription to the Putnam County Courier to access this content.